Classic American poet and author Ralph Waldo Emerson once wrote that we should seek to imitate people better than ourselves. Since we all have areas in which we can improve, that’s not bad advice, especially if we seek to imitate successful people. In fact, researchers have found that successful people have certain routines or habits they carry out daily that help to make them successful. Check out these six habits to see which ones you’re already doing and which ones you might seek to imitate! When you have something specific to accomplish, such as returning a call, writing it down is a good idea. However, putting it on a to-do list is not as helpful as you think. The better choice of successful people is to schedule that return phone call on your calendar for a specific time and date. Then, it won’t be brushed to the wayside in favor of something else. It becomes a commitment. How often throughout the day do you check your email or social media accounts? If you’re like most people, you check or reply each time you hear a ding or a buzz. The problem is, those interruptions keep you from finishing what’s most important. The habit of successful people is to have a particular time to read and respond to communications, such as in the morning or before bed. Many people who’ve worked just about any kind of job have encountered micro-managers: those who not only give an assignment but also provide specific instructions on how to do the job and then supervise — and slow down — your work. Micro-management leads to wasted time and energy. However, giving up control over details will free you to go on to the next thing with vim and vigor. That’s why successful people don’t micro-manage. When a document comes to you for your signature or for your review, taking care of it at the moment saves you future time. That’s why successful people have the habit of dealing with important things right away. They know that time is a commodity that can’t be replaced, so they create time in the future by dealing with the key items first. Successful people have routines, especially related to how they start their day. Why? Because when you know what to expect, you’re free of anxiety, which is a time-waster. Also, having a morning routine sets you up for success by eliminating anything that would throw you off course and give you an excuse for getting up on the wrong side of the bed. Among the many activities and events that successful people plan, they don’t forget their values or what’s most important to them. That’s why successful people plan according to their values, making what’s most important the highest priority each day. What’s most important to you? If it’s being successful, you can count on the experts at Donohoo Accounting to support your success. We’ll keep your personal and business finances on track just as we have for other successful people during the past 20 years. Call us today for a free consultation at 513-528-3982. Check us out on Facebook, Twitter, and LinkedIn for our latest updates! While hard work accomplishes much, it’s not the primary key to success in business. On the other hand, applying smart management practices tends to sustain businesses over the long run. Because these seven smart management practices have helped lead to success for other entrepreneurs, see if they will do the same for you. To become successful in business, you will be required to make sacrifices. In fact, you may have to give up a number of activities, habits and/or relationships that don’t promote success because they’re wasteful, distracting, inefficient or unrelated to your goals. As hard as it may be to give these up, successful entrepreneurs keep their focus by making sacrifices. Having successful people around to work, advise you, or just make suggestions provides opportunities to learn from them and apply their lessons to your business operations. While your education, background and experience lend something important to your business’s success, the people you spend the most time with will have even more influence. To buy or not to buy? While it sounds like Shakespeare, it’s the question consumers ask themselves when faced with a decision to part with their money and become the owner of goods or the user of services. The deciding factor, however, lies in the weight the customer puts into the “buy” or “not buy” basket based on the information they have about the product or service and their personal needs. Thus, people buy goods or services, they are not sold. Is there some skill you wish you could be great at performing? To move from wish to reality, spend some time practicing that skill. The more time and effort you put into practicing, the more naturally the skill will occur. And so it is in business, the more you practice the skills that promote success, the more success your business will experience! In business today, customers’ needs must be met faster than ever before. And while patience is a virtue, it’s also too much to ask of most customers who are used to getting what they need immediately or almost immediately. On the other hand, making updates quickly in business technology and in process improvements often leads to success by securing your place in the market or outpacing your competitors. Whether it’s how an employee spends his time or how long it takes her to produce a widget, that time is costing your business money. That’s why efficient processes and well-trained employees are essential parts of the equation for successful business owners, saving your business time — and therefore — money. Finally, and perhaps most importantly, the wise management of your company’s resources is integral to its overall success. Keeping accurate financial records, filing and paying taxes on time, and responsibly accounting for the revenue that flows in sustains your business for the sake of your customers, employees, management and shareholders or investors. 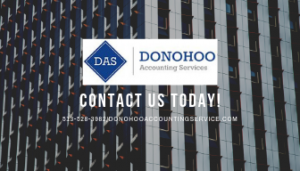 Here to help your business manage its financials are the professionals at Donohoo Accounting, where we’ve been helping small businesses wisely manage their finances for more than 20 years. For a free consultation, call us today at 513-528-3982.